When a small group of quirky and oddball characters including – a blind guy, a burnout, a teen phenom and a conspiracy nut – specialising in proving impenetrable security systems and unbreakable codes wrong, are conscripted for a one-off ‘hush-hush, ask no questions’ job, little do they know that the reality of the mission is more far reaching and impossible than any could ever imagine. The plot might be similar to many used in Hollywood over the years, have our unlikely heroes hunched over laptops and high-tech thingamajigs, hike others obey or relay instructions through earpieces, but it is the cast that elevates this film, albeit only to worthiness. 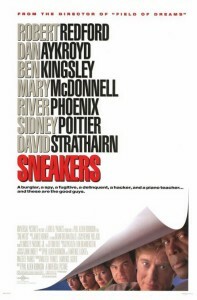 Sidney Poitier and Robert Redford supply the gravitas, Dan Ackroyd and David Strathairn the moxie, River Phoenix the energy and Mary McDonnell the spunky love interest. Between them they take turns pulling off the improbable and occasionally impossible, conjuring hairbrained theories and breathtaking feats on the fly, as if all of the split second timing and good fortune was indeed scripted. 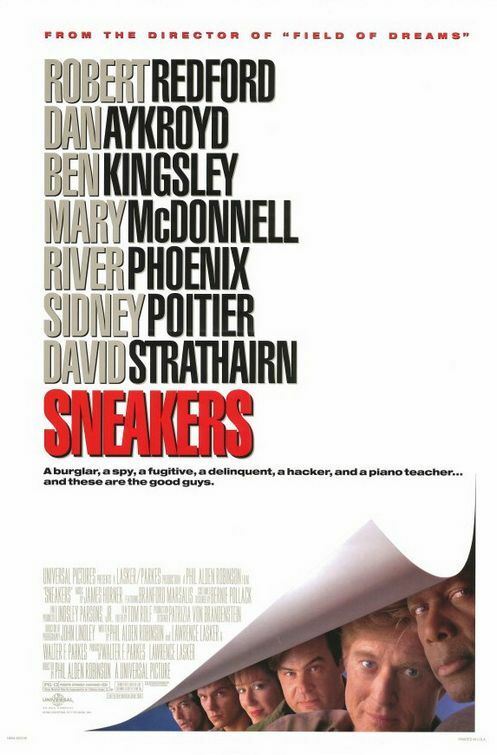 Sneakers exists in a world that no one really lives I where danger is laughed off and pithy retorts are always at the ready, where several geniuses with incongruent skillsets and personalities somehow always gel. You might hurt yourself wondering just how all of this could be pulled off without a hitch, but then you’d miss the enjoyment value. Final Rating – 7 / 10. Proved altogether too ‘sneaky’ to make a dent when released, and has ‘sneakily’ managed to almost vanish from trace. Still, a worthwhile – if lightweight – ensemble piece.